Boston Bay and Approaches Massachusetts. 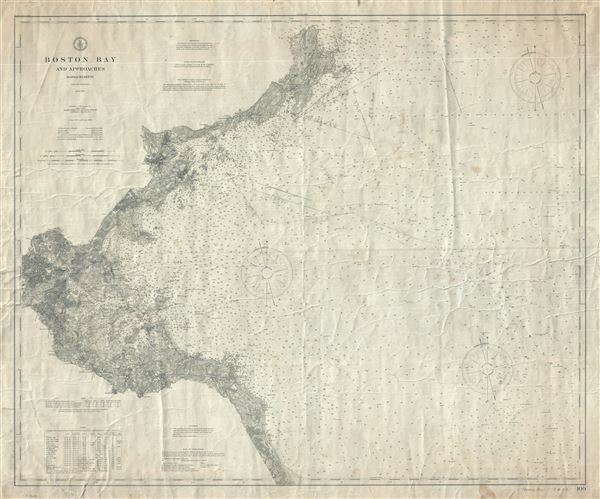 This is a large 1905 U.S. Coast and Geodetic Survey nautical chart or maritime map of Boston Bay, Massachusetts and its approaches. It covers the Massachusetts coastline from Marshfield north past Cohasset, Weymouth, Quincy, Boston, Lynn, Marblehead, Salem and Gloucester to Cape Ann. It offers astounding inland detail, noting individual buildings, roads, bridges, rivers towns and topography. In addition to inland details, this chart contains a wealth of practical information for the mariner including countless depth soundings, coastal features, lighthouse locations, notes on elevation, storm warning displays, tidal information, etc. This chart is presented on the Polyconic projection. First published in 1872, the chart has been updated with corrections to 1905. Published at Washington D. C. by the Coast and Geodetic Survey under the supervision of O.H. Tittmann, Superintendent. Good. Overall toning and creasing. Some foxing at places. Manuscript markings in pencil at several places, can be erased, but have been left intact.